Here's our huge collection of original, high quality, printable Halloween colouring pages for kids! We've got something for all ages here - and everything from haunted houses to ghosts and monsters and witches and pumpkins and more! Here's a cute baby ghost colouring page to print for your Halloween activities with the kids! Here's a fun bat colouring page to print for younger kids to colour in, with simple outlines and a cheeky face! This bat colouring page certainly doesn't feature the scary type of bat - but rather the loveable sort! Colour him in and cut him out for a cute Halloween display - especially if you do more than one! This is most definitely our cutest bat colouring page of many! When the kids have coloured him in, why not cut him out and put him on display? Lots of lovely bats hanging from the ceiling or windows would make a fun Halloween display. Here's a fun dot to dot for Halloween. Join the dots carefully to reveal a Halloween bat... Choose from three versions - one with numbers, one with lower case letters and one with upper case letters. Colour in this lovely countryside night-time scene - perfect for Halloween! The kids can have fun adding some Halloween colour to the sky on this one. One of the best memories that many of us is of carving Jack O Lanterns out of pumpkins on Halloween just like the children in this lovely colouring page for younger kids are doing! Click the link below for our printable version. A group of children are enjoying a pumpkin carving session in this fun printable colouring page. There are some great jack o lanterns taking shape, and lots of detail in the picture to look for! This cat colouring page features a rather sleek looking cat - the kind that is confident and knows exactly how to keep its owners in check! I've also included this colouring page in our Halloween listing because I don't think this cat would like out of place on a broomstick! Fill up the cauldron or the pumpkin with doodles and patterns for Halloween! A fun alternative to a normal colouring page - our Doodle Pattern Tiles are designed to encourage the kids to fill up the pictures with creative designs and/or colouring. Four kids in disguise head out for some trick or treating in this Halloween colouring page - or are they actually animals in disguise? Print and colour this Frankenstein colouring page for younger kids - it's perfect for Halloween or any time a gruesome monster colouring is required! Here's a very scary version of Frankenstein for kids to print and colour in for Halloween! Print out our ghost colouring page for some fun Halloween colouring for younger kids. He's simple but he's cute! Why not do a host of ghosts, cut them out and hang them around the classroom or house? This ghost colouring page is a great one for younger kids. His lines are just about simple enough for you to cut him out for a Halloween mobile or to put on display. Children will have so much fun colouring this ghost maths fact colouring page that they won't even notice that they are practicing their addition to 10 sums! Here's a fun printable Halloween colouring page featuring ghosts and bats in a scary picture. It makes a fun counting puzzle for younger kids, too. How many ghosts can they count? How many bats? Not all ghosts are men - so we've got a girl ghost colouring page on the site too! And very glamorous she is too! A fun printable Halloween colouring (coloring) page featuring a group of children in Halloween costumes heading off to collect some Halloween candy! This little Halloween colouring booklet is designed for older kids, as the pages are really quite detailed and will need care and attention at this size! Just print onto A4 paper and then fold using our origami booklet instructions. This is such a fun activity for the kids at Halloween! Cut out the missing squares from the colouring page and stick them carefully back in place before colouring the whole Haunted House scene in. Our Halloween decorations colouring page features a group of children enjoying some Halloween crafts and decorating their classroom or playroom. There's lots of detail to make this a fun Halloween colouring page for older kids. These Halloween doodle colouring bookmarks would be a great way to keep early arrivers busy at a Halloween party and would give them a fun momento to take away. Print, colour, cut out and stick to decorate this house for Halloween! 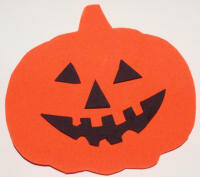 We have all sorts of Halloween decorations to choose from, colour in, cut out and stick on! Designed for younger children, this Halloween colouring page shows a group of kids enjoying a Halloween party and feast! Click the link below for our printable version. Here's a spooky haunted house colouring page for kids to print and enjoy at Halloween. 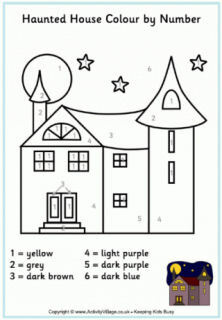 This simple haunted house colouring page is designed for younger kids, with its bold lines and simple shapes. We have more complicated designs for older kids, too! Designed for younger children, this Halloween colouring page features a rather spooky Haunted House for the kids to colour in. Just print and enjoy! Click the link below for our printable version. Here's a detailed haunted house colouring page - one for older children! Can you ever have too many haunted house colouring pages? I don't think so! This one has empty windows so the kids could have fun drawing some ghosts or ghouls or other Halloween characters looking out. Or perhaps even the members of their family! Count the cats and colour in this detailed Halloween scene - there's lots to spot! Here's a Jack o' Lantern or Halloween pumpkin colouring page designed for the youngest kids. 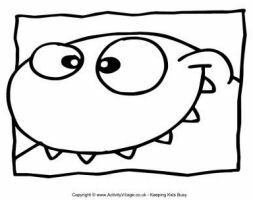 You could also colour it in, cut it out and turn it into a fun Halloween mask! 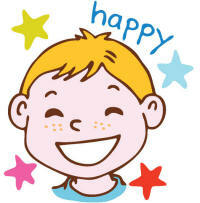 This is a lovely cheerful carved pumpkin colouring page for younger children to enjoy at Halloween. With its simple lines it is also a good one for cutting out, perhaps to hang for a Halloween mobile, or to display on the fridge? Children need to complete some simple addition sums and follow the key to colour this Jack O' Lantern maths fact colouring page. Here's a delightful Halloween colouring page for younger children, showing a group of kids out in costumes on Halloween evening for some trick or treating! Just print and enjoy! Click the link below for our printable version. Here's a big, bold mummy colouring page for younger kids at Halloween! Most mummies have white bandages (which wouldn't give you much opportunity for colouring in) but who's to say that this one can't be multi-coloured! I have to admit I hesitated when we thought about publishing this poison bottle colouring page, as it seemed a strange thing for children to be colouring in! However, as part of a Halloween display, or reinvented perhaps as a bottle of rum for a pirates topic, I think it might have its uses. Fun for Halloween, this skeleton colouring page is designed for the youngest children, with big bold lines and cheeky wave! Here's a skinny ghost colouring page to print for the kids this Halloween. He's got lots of character - he looks like he would be fun to meet! This fun Halloween colouring page is of a witch's spell room, and there is so much in there to spot while you are colouring it in! This cheeky spider is hanging from a perfect web! He makes a very simple colouring page for younger children, possibly at Halloween. Here's a fun spider colouring page for Halloween or as part of a minibeast project perhaps. No one could be scared of this spider! This funny spider colouring page is far from scary, so he makes a perfect one for younger children – perhaps at Halloween? Draw your own web for the spider and then colour in the whole page. This page is included in our My Halloween Doodle Fun book in the shop. Here's a cute Halloween colouring page for younger children showing three pretty witches around a cauldron, mixing up a spell for this spooky holiday! Just print and enjoy! Click the link below for our printable version. This fun printable colouring page shows a group of kids all dressed up in Halloween costumes ready to go out trick or treating in their neighbourhood! A Halloween colouring page for younger children, showing Halloween trick or treating. Click the link below for our printable version. Add some extra Halloween creatures to this picture before you colour it in! This page is included in our My Halloween Doodle Book, in the shop. Here's a detailed free printable colouring page of a wicked witch looking in her crystal ball, for Halloween or fairy stories. Her black cat looks on and the shelf is full of interesting potions for spells! Our big, simple colouring pages are great for younger kids at Halloween, and this witch colouring page is no exception! Colour in this lovely witch, riding on her broomstick, for Halloween! Our witch maths facts colouring page will have children practicing subtraction without even noticing. Solve the sums and colour the picture by numbers. This super witch's hat, sprinkled with stars, is crying out for some bright colours! How will the kids choose to colour it in? There is so much detail in our Witches Around The Cauldron colouring page - it's great for older kids at Halloween. We have a huge assortment of monster colouring pages including a "classroom" set which is very popular with younger children. 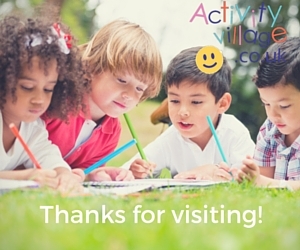 We think this is the best collection of Halloween crafts for kids on the internet, and it is certainly one of the best crafty themes at Activity Village! We've got pumpkin crafts, ghost crafts, skeleton crafts, witch crafts, monster crafts and much more. If you feel like sitting down with the kids and making something spooky for Halloween, please check it out!